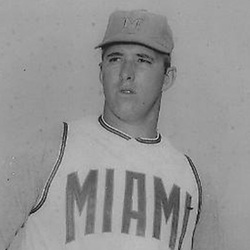 Warren was one of Coach Ron Fraser's most durable and consistant pitchers in the early years of the Miami Baseball Program. Back before Hurricane Baseball was THE place to be in South Florida, he helped lay the groundwork for the building of Mark Light Stadium and the glory years to come. The Lyndhurst, New Jersey native set standards for future players to reach, and was described by Coach Fraser as one of the most selfless and competitive team players of all time for UM Baseball. In his two seasons at Miami, "Bog", as he was known to his teamates, would lead the team in victories and innings pitched each year. His 9 complete games in 1966 was a then-school record, now tied for 4th. His earned run average that year was 2.52. His 15 career complete games still ranks 6th on the list. He struck out 242 opponents in 191 career innings for an average of 11.4 strikeouts per nine innings...a record that stands today. Warren struck out a then-school record 128 batters in 1966, back when UM played less than 40 games...it is still in the Top Ten. His 17 strikeouts against Rollins on May 6, 1966 is the 7th highest. Ever the tough competitor, and back before designated hitters, Bogle hit for himself and had a career .329 average and .523 slugging percentage, both figures still in the school's Top 10 for batters with less than 300 at-bats. And, in 1967, he led the team with a .620 slugging percentage. Warren was drafted in the fourth round (73rd overall) of the 1967 Major League Baseball Secondary draft by the then Kansas City (now Oakland) Athletics. He would make his major league debut in Yankee Stadium on July 31, 1968, becoming the FIRST Miami Hurricane baseball player to make it to the Major Leagues ! He would return to UM to obtain his Masters in Education in 1971 and help the program by coaching the freshman baseball team. He is a member of the Lyndhurst (N.J.) High School Hall of Fame and the Bergen County (N.J.) Baseball Hall of Fame.